One of the most valued treasures of the Scorsese canon, 'Mean Streets' birthed Scorsese's distinct cinematic vision of the world: street-wise, working class hoods with foul mouths and hair-trigger tempers seen through the lens of a dynamic camera with bursts of slo-motion and jumpy editing, set to a soundtrack of '60s vinyl and Italian crooning classics. The opening 30 minutes established Scorsese's style emphatically ― it's a riveting introduction to the characters, location and flavour of the film. There's Charlie (Keitel), the confused gangster torn between his loyalty to his friends, his girlfriend and his faith, and the mentorship of his mob heavy uncle; Johnny Boy (Robert De Niro), the irresponsible loose cannon and boyhood pal of Charlie's; Tony (David Proval), the nightclub owner and host to the film's character interactions; and Michael (Richard Romanus), the affable loan shark chasing down the debts owed by Johnny Boy. But the film essentially begins in the nightclub, bringing this foursome together. 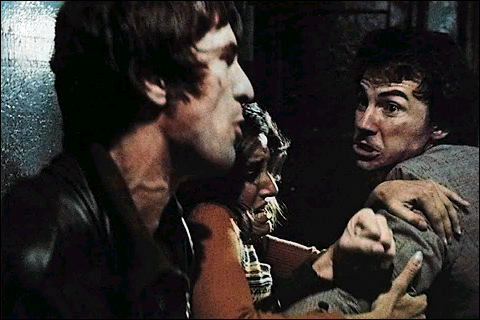 In particular, two shots in this scene essentially announce Martin Scorsese as a master: Charlie's entrance to the club, with Keitel moving through the crowd, the camera following elegantly behind; and Johnny Boy's arrival, with De Niro sloppily prancing around, two women on his arms, set to the rip-roaring Stones classic "Jumpin' Jack Flash." These are two great character introductions, the contrast of which expertly foreshadows their intense conflict, which drives the movie. The rest of the film is a mix of these lively, rambunctious moments and anger-fuelled confrontations, which result in an aggressively violent ending reminiscent of the bloodshed in his next milestone film, Taxi Driver. But the experience of Mean Streets is less traditional narrative storytelling than a cathartic expression of Scorsese's youth and the intimate connection to filmmaking, an obsession that famously permeates his very being. Sadly, despite being so influential in his career, Mean Streets always gets the short shrift. It's one of the last Scorsese pictures to get the Blu-ray treatment and sadly only a "catalogue" treatment by Warner, which means cribbed extras from a previous DVD release, a plain plastic box and uninspired cover art with none of the glossiness given to other (arguably lesser) Warner films of late. But the high definition transfer is decent, considering the grainy, run-and-gun, unpolished look employed by Scorsese. The vintage featurette is rudimentary and short, showing Scorsese and the two boyhood pals who inspired the film walking through the authentic Little Italy filming locations. Audio commentary by Scorsese should always be cherished, but, as usual, his comments are a mix between informative and meandering.